American humorist Don Marquis labelled us all with the quotation below and it seems remarkably unfair that an entire subset of the human population should be labeled as dishonest simply because they choose fishing as their passion. Actually I am pretty sure that most of us aren’t quite so immoral but the general perception, and as they say “perception is reality”, is that one should take fishing stories with a pinch of salt. Actually I know more than a few fly fishermen who, in reading Marquis’ comment, would take greater offense at the suggestion that they wore tattered hand-me-downs than the idea that they were less than forthright when it comes to tales of their success or expertise. In some circles dapper togs are seen as more important than honesty. I have to confess that on the stream I generally look like something the cat dragged in, pragmatism overcoming any sense of fashion and perhaps that lends some additional credence to the stories I choose to share. I find suggestions that my fishing attire is somewhat low brow quite acceptable but I do take offense at being labelled a fibber. In the end though I suppose we all have our own set of “fishing stories” you know, the real ones not the hyperbole of anglers given over to exaggeration or the fabrications of the overtly dishonest but real anomalies which push the bounds of credibility but remain none the less actually true. In general I figure that stories that aggrandize the skills of the angler are more worthy of suspicion than those which highlight their inadequacies, such that the “I hooked the bushes for a third time” sorts of tales are, for the most part, more honest than the “it was definitely into double figures” accounts of capture. Given that the latest odd happening on stream suggests no skill on my part, one hopes that the telling of it will have some level of credibility. 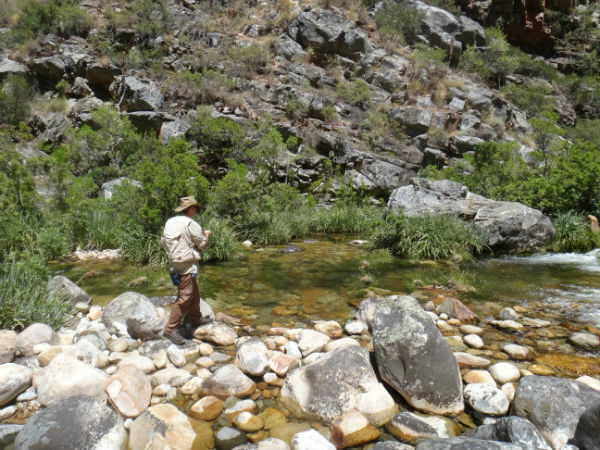 Gordon McKay in the high country searching out cooler water and active trout. Myself and an old friend had hiked high into the mountains on a dreadfully hot day in the hope of finding some cooler water and active trout. It is a remote location, dangerous even from the perspective that escape in the case of mishap would prove tricky at best. The stream is home to both trout and bass although another reason for the hike in is that as one gains elevation the ratio of bass to trout leans further in favour of the salmonids. The fishing was slow, the water warm and I wasn’t fishing well. I had lost two trout before I noticed that there was a small burr on the point of the hook which had obviously limited its penetration. Not checking after the first loss is a sign that my fishing has deteriorated, I am an avid promoter of hook sharpeners and checking the fly in the event of any question as to its soundness, that I had failed to do that was indication that I had let things slide. Then I spooked a number of fish with poor casts or line flash and in turn was broken off by a really nice fish which headed around numerous clumps of riverine grasses snapping the tippet. In fact, a combination of poor fishing and even poorer conditions meant that at the end of day one my net had remained dry as a bone. The following morning I headed out with renewed hope, setting off from camp in the early dawn trusting that the slightly cooler conditions and relatively low light might see more active fish. I also thought that perhaps having had a day of practice, I don’t get to fish anywhere near as much as I used to, would have got me “back in the groove”. After a short hike downstream I sat quietly and re-rigged a new leader, fresh tippet and tested the outfit with some exploratory casts. Happy that all was well I proceeded up river fishing carefully and seeking out likely pockets as well as constantly scanning for active fish in the clear water. The first trout spooked at the sight of the fly on what I thought was a really good presentation, the day was looking like being just as trying as the previous one. Then I came across a fish feeding in some moderately fast flow and after it ignored the dry fly on three drifts I changed tactics and added a nymph to the terminal tackle. The fish was obviously feeding but apparently reluctant to come to the top. That trout took the nymph and so I carried on with the same set up, missing a couple of opportunities and at the same time landing a few trout. It seemed that the subsurface pattern was the way to go and each fish in turn ignored the dry to consume the tiny nymph fishing a few inches under the surface. The combination of pragmatic functionality and hand crafted beauty. My Deon Stamer landing net. The trout on this stream are particularly partial to feeding right in the tail-outs of the runs and it can prove tricky to get your drift into the correct spot before the leader is whisked away by the current and entangled in the ever present riverine grasses. I had spotted a fish lying tucked tightly at the back of a small run and fortunately got the cast right first time. The fish took the nymph dragging the small dry fly underwater and I struck into a solid hook-up. It wasn’t a particularly large fish perhaps twelve inches long but as soon as it began to struggle against the line a bass began chasing it all over the small pool. This isn’t a scenario that is particularly rare, frequently hooked fish get followed about by another, either a trout or a bass for that matter. 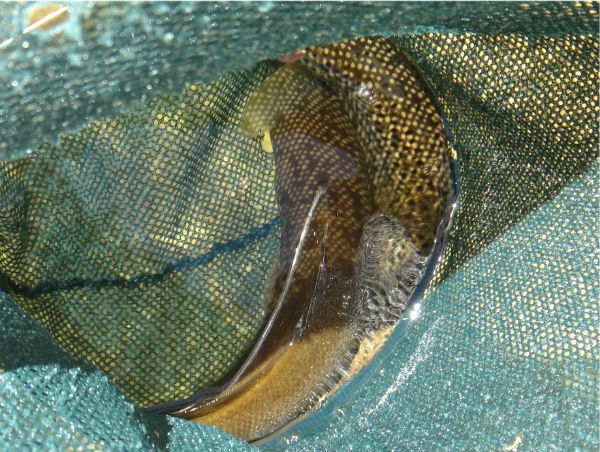 After a spirited fight the trout came to the net and I prepared to land it prior to release. The net I use is a gorgeously hand crafted tear drop made for me by local net builder Deon Stamer. It is a thing of both beauty and functionality but not overly large. Still I slipped the net into the water and scooped up the trout only to have the bass follow my prize right into the mesh, such that to my absolute surprise when I lifted the net from the water it contained not one fish but two, only one of them actually attached to the line. The nymph hooked trout and the overly aggressive smallmouth. I don’t dislike bass particularly but I am not overly fond of having them in trout streams and so unfortunately for the bass its predatory zeal proved to be fatal. 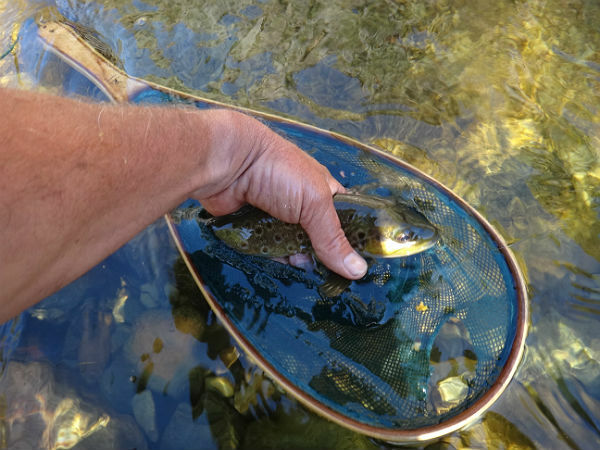 The trout was returned to the water unharmed and perhaps with slightly better prospects given that a competitor for the resources of the pool had been removed. The proof of the pudding, two unhappy bedfellows, a trout and a bass netted at the same time. In some forty odd years of fly fishing I have witnessed and been party to a good many oddities, I suppose that if one does something often enough all sorts of strange things happen, but this still has to rate as one of the more bizarre. Bizarre perhaps, but at least true. More (hopefully) entertaining, educational and occasionally apocryphal stories from the author of this blog can be downloaded from Smashwords and Inkwaziflyfishing.